This should only be operated if the vehicle is stationary. 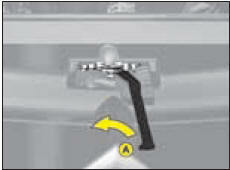 To release the bonnet, pull control A located under the dashboard to the right. Move the lever A, located above the grille, to the right of the chevrons, then lift. Bonnet stay: detach the stay and pivot to introduce it into the notch 1, then into the notch 2 (see the arrow reference). 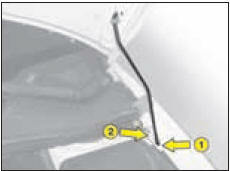 Return the stay to its initial position, lower the bonnet and let it slam shut. Make sure that the bonnet is securely locked. Avoid operating the bonnet when there are high winds.